SSPX Bp. Fellay laments Vatican Turnabout: "It's like in the Game of the Goose"
he happily proclaimed that "we are on the eve of important events"
he disingenuously claimed that the SSPX "never wanted to be separated from Rome"
he rejoiced that Francis "considers us Catholics" while admitting in the same breath that "doctrine is not that important to him"
he flaunted the permission he had received from Rome to "ordain priests freely"
he gave credence to "Cardinal" Muller's ridiculous claim that the SSPX was needed inside the Novus Ordo Sect to "fight the Modernists"
Alas, all of this now to no avail. As we reported on July 2, at the initiative of "Cardinal" Gerhard Ludwig Muller (but approved by "Pope" Francis! ), the Vatican has suddenly made a 180 degree turn: Now it is the SSPX that must accept the Vatican "as they are". And that means: Every single SSPX priest must make the Profession of Faith of 1998, sign a declaration of acceptance of all Vatican II doctrines, and declare his acceptance not only of the validity but also of the lawfulness of the Novus Ordo Missae of Paul VI. In other words: The SSPX must become fully Novus Ordo, without any ifs, ands, or buts. This is what the last 16+ years of rapprochement, dialogue, and negotiation have produced. Congratulations. On June 29, Bp. Fellay made his first public comments in response to "Cardinal" Muller's June 27 letter informing him of the new requirements. The following is our exclusive English translation of a post that appeared on the well-informed medias-catholique.info web site. "Cardinal" Müller throws Monkey Wrench into SSPX-Rome Reconciliation: Vatican now demands Full Acceptance of Vatican II and Novus Ordo "Mass"
Best of all, not only were these requirements decided on unanimously, they were also approved by "Pope" Francis! In other words: Muller and Francis have stopped any SSPX-Rome deal dead in its tracks, for it is obvious that the SSPX could not possibly agree to these three conditions without entirely and quite openly betraying everything it stands for. "Cardinal" Muller informed the Lefebvrists of these decisions on June 27 in a letter sent to the SSPX headquarters in Menzingen, Switzerland, where Bp. Bernard Fellay, the Superior General, is stationed. Bp. Fellay just forwarded this letter to all SSPX clergy, according to a report published by Christian Lassale of medias-catholique.info, which quotes from Muller's letter and provides additional details. The following text in blue is our English translation of this report. As you know, Pope Francis has expressed time and again his good will towards the Priestly Fraternity, in particular by granting to all its priest members the faculty to validly hear the confessions of the faithful and by authorizing local ordinaries to grant licenses for the celebration of marriages of the faithful who follow the pastoral activity in your Fraternity. On the other hand, the discussion continues regarding questions relating to the full reestablishment of your Fraternity’s communion with the Catholic Church. Regarding this subject, with the approval of the Sovereign Pontiff, I judged it necessary to submit to the Ordinary Session of our Congregation, gathered this past May 10th, the text of the Doctrinal Declaration that was given to you during the meeting of June 13, 2016, as a necessary condition in view of fully reestablishing communion. In this regard, here are the unanimous decisions of all Members of our Dicastery: 1) It is necessary to require members of the Priestly Fraternity of St. Pius X to adhere to the new formula of the Profession of Faith dating from 1988 [sic -- should read 1998] (see attachment). Consequently, it is no longer sufficient to ask them to profess the Profession of Faith of 1962. 2) The new text of the Doctrinal Declaration must include a paragraph in which the signatories declare, in an explicit manner, their acceptance of the teachings of the Vatican II Council and those of the post-conciliar period, giving the said doctrinal statements the degree of adherence that is due to them. 3) The members of the Priestly Fraternity of St. Pius X must recognize not only the validity but also the legitimacy of the Rite of Holy Mass and of the Sacraments, according to the liturgical books promulgated after the Second Vatican Council. The Priestly Fraternity of St. Pius X does not seek foremost a canonical recognition to which it has a right, because it is Catholic. The solution is not simply juridical. It pertains to a doctrinal position which it is imperative to manifest…. Divine Providence does not abandon the Church, the head of which is the Pope, the Vicar of Jesus Christ. That is why an incontestable sign of this restoration will be in the Sovereign Pontiff’s manifest desire to give the means for reestablishing the order of the priesthood, of faith, and of Tradition—a sign which will be, moreover, the guarantee for the necessary unity of the family of Tradition. It is too early, at this point, to give a full assessment of this latest development. It certainly seems to fly in the face of all the recent über-conciliatory efforts on the part of Rome, such as the concessions on confessions and marriages -- so much so that some people are already speculating that this may only be a trick to temporarily pacify those in the SSPX who oppose a reconciliation with Rome, until a more opportune time. In any case, this is a fitting farewell gift from "Cardinal" Muller, who has always been hostile towards the Lefebvrists even at the diocesan level back in his Regensburg days (the SSPX seminary in Zaitzkofen is located in his former diocese). With great amusement we can now recall what "Cardinal" Muller said to Bp. Fellay earlier this year about their impending reconciliation with the Vatican: "We wait for you so that you may help us fight the Modernists." We told you back then that it was bovine manure, and we were right. And so, at least for the time being, we seem to be back to square one. The SSPX will have to give some sort of a response, so surely we will hear more about this soon. Stay tuned. In his new role as head of the CDF, Ladaria is now also the head of the "Pontifical" Commission Ecclesia Dei, which deals exclusively with matters related to the Lefebvrian Society of St. Pius X (SSPX). His new position also makes him president of the Pontifical Biblical Commission and the International Theological Commission. A new position for 69-year-old "Cardinal" Muller has not yet been announced.To avoid confrontation over Dubia? Finally, permit us to express our great astonishment at the reaction to this Roman decision. The Personal Prelature which is being dangled before the eyes of the Society of Saint Pius X was supposed to recognize us as we are, and to maintain our independence vis-à-vis the local Ordinaries. However, the first decisions taken consist in unjustly submitting our marriages to these very Ordinaries, while tomorrow the opening of any new Houses will have to meet their approval. This shows to what extent double-speak reigns supreme not only in the domain of Faith and Morals, but even in these canonical matters. Also, in this Centenary Year of the apparitions of Fatima, we invoke the Immaculate Heart of Mary, not so that She will end our canonical situation which is judged irregular by some, but so that the Church may be freed from Its Modernist occupation and that the highest authorities may once more find the path followed by the Church up to Vatican II. Then our bishops will be able to place their episcopacy in the hands of the Sovereign Pontiff. Vatican Journalist: "Francis and Benedict no longer on Speaking Terms"
SSPX-Rome Reconciliation: Vatican's "Abp." Guido Pozzo says "The Holy Father is Pressing Forward"
Poor Bishop Bernard Fellay! The Superior General of the Society of St. Pius X had worked so hard to get his adherents all lined up to be led by the hand into the mouth of the wolf known as “full communion” with the Vatican II Sect, under “Pope” Francis no less. Although he has just been relieved from his post as Prefect of the Congregation for the Destruction of the Faith and the Ecclesia Dei Commission, “Cardinal” Gerhard Ludwig Muller was certainly still in charge back in May of this year, when, as it has just been made known, the then-head of the CDF called a plenary session of his congregation to discuss once more the doctrinal declaration the Society of St. Pius X will be required to sign as a condition for full reconciliation with the Novus Ordo Sect. Well, that didn’t take long: A day after an unconfirmed report made the rounds according to which Francis had dismissed “Cardinal” Gerhard Ludwig Muller from his post as head of the so-called Congregation for the Doctrine of the Faith (CDF), the Vatican not only confirmed the report but also immediately named a successor to Mr. Muller: It is “Archbishop” Luis Francisco Ladaria Ferrer — a Jesuit! The formal announcement came in today’s bollettino of the Vatican Press Office (Italian original here). Strictly speaking, Muller was not “fired” by Francis but simply did not have his expiring 5-year appointment (which began on July 2, 2012) renewed. On Sunday, May 7, seven deans (heads of deaneries) of the Society of St.
It’s that time of the year again when Jorge Bergoglio sends out greeting cards, and it’s not pretty — literally. For Easter this year, Francis chose a design by the same artist whose work was featured on the 2014 Christmas card, which drew everybody’s immediate attention to a donkey’s rump, which was the most prominently featured part of the card. Out of all the beautiful paintings of the Resurrection and the Resurrected Christ they could have chosen, the Vatican under “Pope” Francis chose, of course, one of the ugliest designs they could find. Andreas Englisch is Germany’s most celebrated Vatican insider and “papal” biographer. In a lecture given on March 16, 2017 in Limburg (the diocesan headquarters where Benedict appointee “Bishop” Franz-Peter Tebartz-van Elst was removed by Francis in 2014), Englisch made some explosive claims about the relationship between the “Pope” and the “Pope Emeritus”: The two men are at complete odds with each other and are no longer on speaking terms; Benedict XVI only makes a public appearance when Francis orders him to, according to Englisch. Once again breaking news in Novus Ordo Land: The Roman Novus Ordo cleric who goes by the pen name of Fra. Cristoforo (“Bro. Christopher”) has just published some additional information about the four “dubia cardinals” (Caffara, Brandmuller, Meisner, and Burke) and why the previously announced “formal correction of the Pope” has been scrapped. Last week, after Fra. Cristoforo had revealed that the formal correction was not going to happen, Vatican journalist Edward Pentin sent out some tweets (see here and here) contradicting the claim, saying that the information was not correct and the formal correction was “still on.” Fra. These days, barely a day goes by when someone in the Vatican isn’t giving some sort of an interview. Today it was “Archbishop” Guido Pozzo’s turn once more. 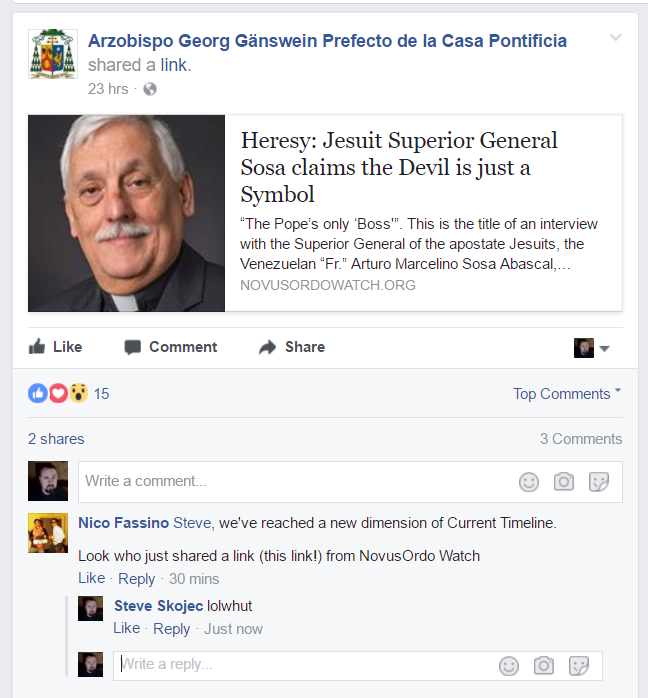 Pozzo is the secretary for the Pontifical Commission Ecclesia Dei, the Vatican’s dicastery that exclusively deals with matters pertaining to the Lefebvrist Society of St. Pius X (SSPX). The name Ecclesia Dei is derived from the document that established the commission, John Paul II‘s eponymous motu proprio of July 2, 1988, in which the definitive rift with the SSPX was formalized after Abp.